I am preparing to leave for the annual Gulf Research Meeting in Cambridge, where I am happy to have learned recently I will sit on a panel along with Laurence Louër, whose 2008 book on transnational Shi'a politics includes some of the best insights on Bahrain in many years. I have had very good luck with conferences lately, as my most recent panel also included 'Abd al-Hadi Khalaf, whom I'd not met previously. As I've mentioned before, I will present a paper on the politics of public-sector employment in Bahrain, while Laurence's is titled "The political dimension of the labor market reform in Bahrain." It should be quite interesting. For those interested, I have uploaded my presentation slides here. "He is demanding the empowerment of Al Wefaq under the guise of democracy and human rights. ... The ambassador has since his appointment been particularly active in putting pressure on Bahrain and on threatening and blackmailing the country. His meetings with the opposition do not stop and the US interference in our affairs has reached unprecedented levels." Of course, by modern Interweb standards this story is old news. Yet coverage thus far has been superficial, and no one seems to be making the most obvious connection. A partial exception is regular Bahrain Mirror contributor 'Abbas Bu Sawfan, who offers an extended analysis (Arabic) in Thursday's al-Quds al-Arabi. The source of the anti-ambassador drive, he argues, is the royal patron of the Sunni groups in parliament, Khalid bin Ahmad. So his explanation revolves around Al Khalifa politics. Which is perhaps true. But the more obvious observation is this: with the absence of al-Wifaq, Sunni groups in parliament have lost their raison d'être, which since 2006 has been precisely to obstruct any opposition efforts--legislative or otherwise. Indeed, it is not a coincidence that Bahrain is the only country in which the Muslim Brotherhood serves as a pro-government political faction. This is because it MUST be such if the opposition is to remain a minority in parliament. A question--and, for the state, a problem--thus arises: if they need not concern themselves with blocking al-Wifaq, at whom exactly should (nominally) pro-government groups in parliament direct their energy? Since last fall's by-elections, the answer has been clear, with MPs assuming an increasingly confrontational stance vis-a-vis the government. They have blocked state proposals regarding the reorganization of the flagging Gulf Air; they have clashed on the streets and in parliament with (and even attempted to quiz) Bahrain's Culture Minister Sha. Mai for her purported support of "un-Islamic" events; and one Sunni opposition MP, Usama al-Tamimi, has been calling for corruption investigations into the practices of the ruling family (his business was subsequently attacked). In the second instance, the conflict was so severe that parliament was paid a visit by no less than Khalifa bin Salman, who urged "cooperation" between the legislative and executive branches. The newfound concern among parliamentarians with the actions of the United States and its representatives in Bahrain is therefore at the very least a welcome development for the state, no longer the main focus of Sunni ire. But the main question, of course, is the nature of this shift in agenda. Pro-government movements and media have been decrying U.S. "interference" in Bahrain for more than a year, yet only now has the issue been taken up systematically by MPs. Has the sustained media onslaught finally served its purpose of encouraging popular action against Western influence (and precluding cooperation with the Shi'a and secular opposition)? Or is there more direct prodding on the part of the government--or, that is, on the part of certain members of the ruling family (which is Bu Sawfan's conclusion)? 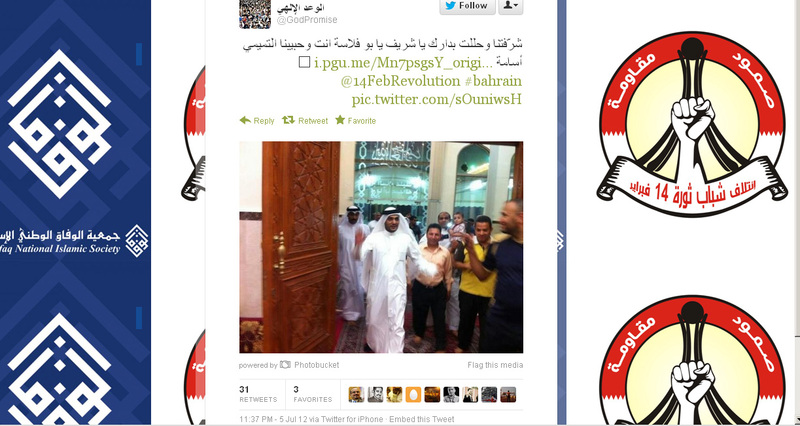 Thus, as they say, is the battle for Sunni hearts and minds in Bahrain. As usual, the losers are ordinary Sunni citizens, as their MPs in parliament debate not corruption or political reform or economic revitalization but the nefarious role of Bahrain's most important Western ally (and probably the main reason why the political status quo was not qualitatively altered by the February uprising). And al-Asalah and al-Manbar wonder why they fared so poorly in the 2010 elections. Also as usual, it will be up to charismatic Sunni activists outside the mainstream political fold--whether Ebrahim Sharif, Al Bu Flasa, al-Tamimi, or others--to see through the game of preoccupation that the state is so adept at playing. If not the Shi'a opposition, it is Iran, or the United States, that must be opposed--so long as it is not the government. In fact, anything sufficiently threatening (that is to say, an actor whose true interests are not easily discerned) will do the trick, such that it is likely that we will soon find tsunamis, earthquakes, and sharks on the list of foreign conspirators against Bahrain. On the other hand, depending on one's view, Al Mahmud and other leaders of the new Sunni movements may have a more constructive role to play. 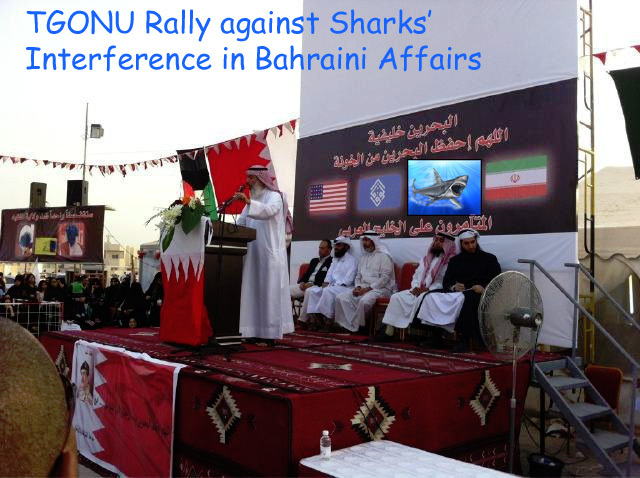 Jane Kinninmont's recent Chatham House paper on Bahrain contained the following observation from a Sunni supporter (but not representative) of the National Unity Gathering: "We are not for the government, just temporarily allied with them" (p. 8, n26). I suppose we'll see about that. 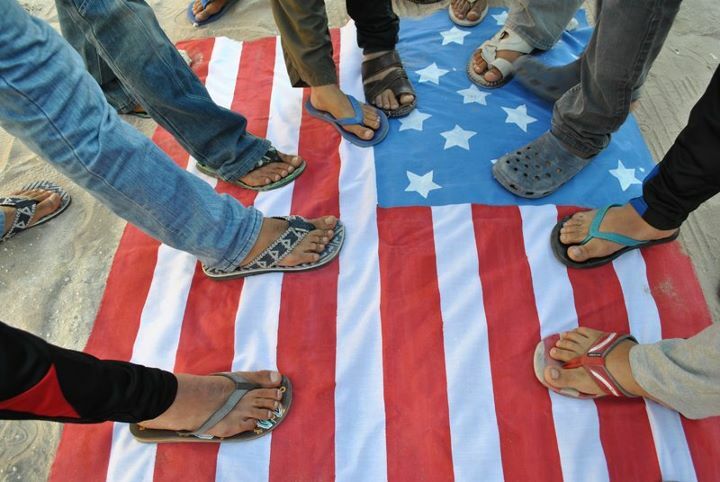 Some people say that the reason that pro-government MPs are playing the role of Anti-America is yet another conspiracy to make people from the opposition think that the solution for Bahrain crisis will be by the help of America. US & UK have made a very good job for Bahrain regime in UN Human Right Council by remaining silent about Bahrain's HR abuses... For this reason, people are becoming more aware about US support of Bahrain's regime..
As for Bu Flasa, I'm not sure what kind of person he is, but I guess that the coming days will tell us more about him. I see you've neglected to mention your thoughts on sharks and how Bahrain might best stop their interference in its internal maritime affairs. Anything specific involving Al Bu Flasa in "the coming days?" Al Tammimi's credibility is shady at best. 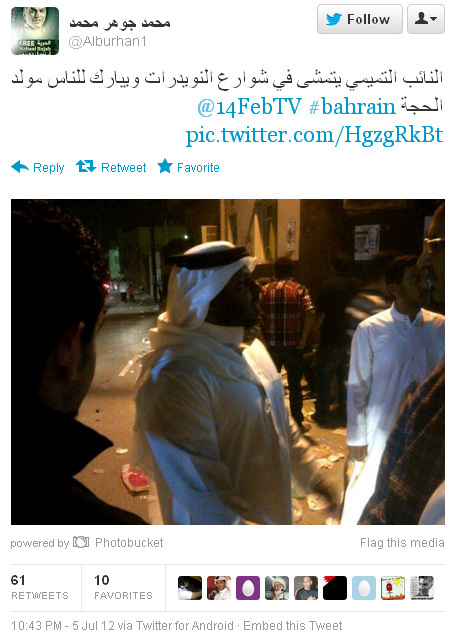 A former kick boxing contender has little understanding of the sensitive issues occurring in Bahrain. Although he does realize the symbolic meanings of visiting Nuwaidrat and a Ma'atam, but politically he is still in an infantile state. However, I believe Al Tammimi's motivation are more personal than political. I do appreciate the fact that the "independent" bloc need for a 'boogeyman', which is deterring what MPs should focus on. Looking forward to meeting you at Cambridge Gengler. Justin, I like your last comment in regards to the temporary alliance between the gov't & TGONU. We sure will see about that. As for people like al-Tamimi & al-Buflasa, they have seen through the blur. Yes, one can continue seeing the world through the lens of "politics" and an obsessive game theory lens or real politik sort of situation, but at the end of the day, people are people and truth touches different people in different ways. Revolutions are born through fantasy, not cold reality... Through "magical reality", to borrow from Marquez. Anyhow... The lesson is we should leave our fears and obsessions aside and embrace uncertainty. Looking back at movement in the past century in Bahrain, it has always been that people have revolted for a clear goal... No Brits & al-Khalifa in the 50's, but the formal opposition fell short of that clear demand to demanding Belgrave's departure and a public representation. And again in the 60's... And the 70's... And so on... The reality is, this system is fundamentally flawed and people have seen that, but the formal opposition is always obsessed with making one power happy over another to maintain legitimacy. In reality, we are replacing one dictatorship with another. True revolution happens when you break through those powers... But that, too, requires people that are awake and willing to take that road.